This time around we’ll be looking at RDM’s lab tables and other lab furnishings. We provide both standardized and custom lab furniture solutions for our clients. Let’s see some of the products we build for this category. This is the Model A-109P-WD Wood Frame Laboratory Table. It features a chemical resistant surface that makes it ideal for heavy duty, general purpose use. Similar models are available in heavy duty steel. Like all of our lab furniture, we can provide many different custom options for everything from surfacing to built-in storage. 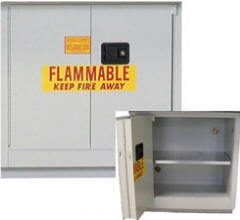 This is one of our Flame Resistant Metal Cabinets. Its reinforced steel construction and coating make it the ideal safe solution for storing flammable materials. This cabinet comes in many different sizes and configurations beyond what’s shown here. This is an adjustable-height lab table frame we had custom designed for a school. Note that at the time this photo was taken we had not yet installed the work surfaces. The customer had specific space, storage and color requirements that we were happy to satisfy. This photo shows the table area (at the back) in a lowered position, but it can actually hydraulically lift above the height of the sink. You can find other pictures in our custom desk gallery. Contact us to order or inquire about your custom lab table or furniture solution. We’re eager to discuss and meet your needs. Lab Table Requirements: Do You Know What Laboratory Furniture You Need? Depending on the state you are located in and your research area, your laboratory will have very specific construction requirements. This is something of particular importance to private labs, especially when the dividing line between lab and workshop blurs. Private enterprises develop prototypes and perform proprietary research according to a profit motive. That means they need safe labs for a reasonable price. 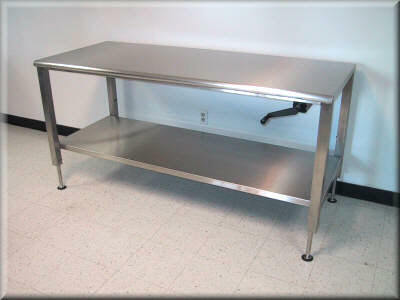 RDM Industrial Products’ lab tables and other laboratory furnishings are designed to be part of the solution. Lab Furnishing Surfaces: Our lab furniture surfaces page discusses the options we can provide for custom and prefab lab furniture. We recommend Trespa’s TopLab Plus™ as an excellent general purpose surface for lab tables and countertops. It’s heat and chemical resistant, hygienic and can be worked like hardwood, to accept grooves, sinks, cup sinks and fixtures. We also offer more specialized surfaces in stainless steel, galvanized steel, resin, laminate and more. If your furnishing requirements are less formal, you may want to consider our industrial workbench line. Lab Furnishing for Ventilation: If you work with gasses, anything that might create gasses in the event of an accident or materials that can contaminate the air in dust or droplet form, you need ventilation systems capable of routing containing them. As you can see in the USG’s guidelines, laboratory fume hoods are some of the most important safety fixtures in any lab where air quality is a concern. We offer standard and custom models to fit your specific applications. Lab Storage Furnishings: Half of lab safety is safe storage. Proper supervision can cut accidents in the lab, but if your materials are stored improperly misfortune can strike long after everyone’s gone home. Storage cabinetry and casework needs to be sturdy and secure. After that, the requirements depend on the materials being stored. Our general purpose lab cabinets are excellent for nonspecific materials storage. Build of 18-guage steel, they won’t be bent or broken in typical accidents. We also have special chemical resistant cabinets and flame resistant cabinets. All of our cabinets support many additional custom features including rollers, peg boards and multiple surface options. The three areas above are not an exhaustive exploration of lab requirements. You should always consult state and federal regulations and guidelines for lab furniture. When you know what you need, please Contact RDM; we have the expertise to provide solutions for any sized lab. Being able to raise work to the right height improves its quality, because it eases manual labor. It gets things done faster, because you can perfect your work flow between stations by (for example) adjusting your station’s height to be the same as that of an adjoining station. These are just two of the reasons you’d buy a hydraulic lift table. Let’s take a look at some of the ergonomic industrial furniture that RDM Industrial Products provides. This is an animated .gif of one of our hand-cranked hydraulic tables. Note the wheels on this model. They allow you to easily switch from a stable to a mobile configuration. This animation shows a table with an electric motor. This provides power to heavy duty models, where a hand crank just won’t provide the lift. This only makes sense, because our toughest models can support up to 20,000 pounds. This is our stainless steel model. It’s often used as lab furniture because the design ensures easy sterilization. Remember to contact us about industrial furniture so we may better understand and meet your needs. Established in 1977, RDM has been in the California Bay Area for over 30 years. We’re right in the heart of the Silicon Valley. We’ll provide your company with the quality products and services you demand on schedule without taking short cuts on quality. We produce workbenches, lab tables, technician workstations, lift tables, laminar flow stations with HEPA filtration, We also manufacture commercial cabinets (European-style with slab type doors), service counters, reception counters, conference tables, counter tops, display and store fixtures, and laboratory cabinets and tops. Our product lines are constantly expanding, and that’s before you count the great deal of custom work we do. For over 30 years, RDM has concentrated on making the furnishing fit the space – not the other way around. If you are local to the Bay Area, come and visit our showroom, located near the Heart of Silicon Valley at 1652 Watson Court in Milpitas, California, where you can view our many styles of lab tables, workstations, workbenches and their accessories. Here you can see our specialty table models in action, like our ergonomic lift table which is equipped with an electronically-operated hydraulic lift system (Model A-107P, Lift Table), or our double sided workstation (Model T-101P), ball-transfer tables, heavy duty tables, LAN workstations, laminar flow stations, and much more. RDM has a huge selection of industrial furniture, lift tables and lab furniture – so much that it almost distracts from the fact that we build plenty of front office furniture too. This week we’ll look at our reception counters. This is a particularly photogenic model with a black marble finish. This counter represents a blending of appearance and practical considerations. The counter is actually being used for coffee service and was built to fit that duty as well as blend in with the rest of the area. RDM Industrial Products specializes in meeting the needs of clients who want a mix of sophistication and traditional durability. 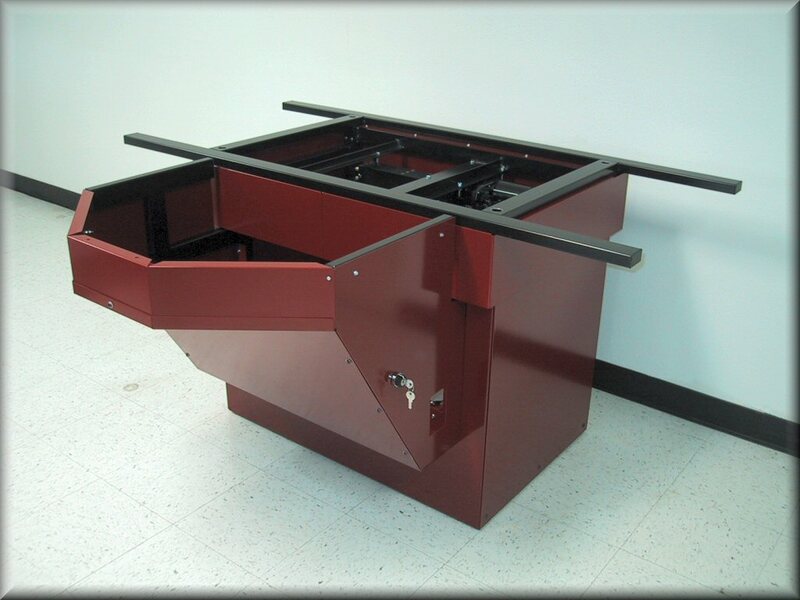 For instance, RDM customizes its adjustable table designs to satisfy their clients’ unique size and load requirements. Their lift table selection also demonstrates these values in action by offering numerous options to modify the basic design. These include clean room standard surfaces and motor-assisted lifting. RDM’s been in the business for 30 years. Located in the competitive San Francisco Bay Area, RDM builds staple furnishings for local high-tech firms, such as the lab tables these clients need to assemble precision products. Packaging tables also display RDM’s ability to manufacture more specialized furniture solutions. From flow tables capable of eliminating particulate contamination to tough commissary kiosks, the company’s commitment to custom solutions is reflected in the way it can cater to each industry without sacrificing quality. Obviously, cafeteria checkouts and microprocessor manufacturing have vastly different needs, but the company manages to cater to both by adhering to high manufacturing standards. This applies to general industrial workbenches as much as unique lab equipment. That’s why RDM has lasted for three decades in one of the most challenging local economies in the world, and why they’re the first choice for so many companies. Buying heavy duty furniture requires more than a trip down to the office supplies store. If you’re equipping a factory floor, a clean room, a large foyer or a cafeteria, your furnishings need to stand up to repeated stress – and if the area’s in public view, need to look good, too. For over 30 years, RDM Industrial Products has been the manufacturer of choice for industrial furniture. Located in the high-tech Bay Area of California, the company supplies staple furnishings for the players in this competitive environment, such as the laboratory tables they need to assemble precision products. Labs order these fully welded tables to custom specifications, ensuring the sturdiness and ergonomic qualities they need for research and manufacturing. RDM specializes in meeting the needs of clients who need a mix of sophistication and traditional durability. RDM’s lift table selection represents these values at work. The least powerful of these hydraulic-assisted, adjustable height tables can lift 1000 pounds to the exact height specified. Options include motor-assisted lifting and cleanroom standard stainless steel. As a manufacturer, RDM can even build an adjustable table to satisfy a client’s unique size and load requirements. Packaging tables are an example of RDM’s ability to manufacture more specialized industrial and lab solutions. The company’s expertise runs the gamut from commissary kiosks to flow tables capable of eliminating nearby particulate contamination. RDM’s commitment to custom solutions is proven by the way it caters to specialized industries. Obviously, clean room microchip manufacturing and cafeteria checkout counters have vastly different needs, but the company manages to cater to both by adhering to an overall emphasis on high quality manufacturing. RDM’s core manufacturing ethic applies to general industrial workbenches and their most specialized lab equipment alike, making them an excellent source for all of your workplace furniture needs.